When Emilia Lopez left her home country of Colombia to pursue a MBA at the University of Chicago, she was certain she would not stay in the US. She loved her work at Citibank Colombia and her network, and most of her family lived there. Life had other plans, though: Lopez met her now husband and her “undeniably better half,” prompting her to accept a position at Boston Consulting Group as a management consultant. After several years of great learning and memorable experiences with BCG, she left consulting to pursue a career with Capital One. “Capital One compelled me for many reasons, among the top: amazing talent with a thick coat of humility, and an inspiring mission that was palpable in every interaction during the interview process,” Lopez says. 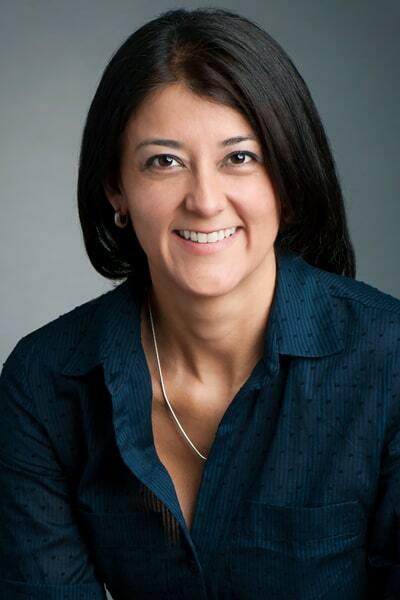 She joined Capital One as a vice president in June 2013. Since then, Lopez has held different roles in the credit card business and was promoted to managing vice president. Most recently, she stepped in to lead the Card Customer resilience team as senior vice president of US Card Customer Resiliency. Her new team supports customers who are facing financial challenges which “in some ways is the ultimate representation of our mission. How we show up with customers when they face difficult times is how we will be remembered,” Lopez says. Lopez spoke with The Alumni Society about how she is helping to create a culture of inclusion and foster the next generation of leaders at Capital One. One of the things that drew you to Capital One is how they value a diverse and inclusive environment. How do you help to create that culture? I believe it’s important to always listen to and seek out points different points of view. Having the discipline to do this consistently and to reflect on all inputs is very powerful. This is far from easy and I don’t always get it right, but I am constantly trying. Our CEO, Rich Fairbank, sets a high bar on this dimension, and the way he leads by example is inspiring. I try a few things. And I put the emphasis on try because I am results-oriented, decisive, and have strong points of view, so it takes effort to slow the process down. In reality, diverse viewpoints lead to better outcomes and a more inclusive environment. I focus on listening and don’t jump to a quick decision. I ask for more information and take time to reflect. There is a saying in Spanish that I share with my teams when I want to reflect: lo voy a consultar con mi almohada. The literal translation is, “I will consult with my pillow.” The essence of this is take time to reflect, listen, and don’t jump to conclusions. When my team and I are landing too quickly on a shared point of view, I solicit other perspectives. I ask someone to play devil’s advocate. Don Busick, an EVP in our digital group at Capital One, is one of my favorite sounding boards. I think of him as the ultimate truth seeker and enterprise thinker. I push to get past differences in style and approach. I have been on the wrong end of being judged on style—my appearance, my accent, or the fact that my hands and eyes do half of the talking for me. When someone’s approach to communication or to problem-solving is different than mine, I make a concerted effort appreciate the differences and try to focus on the substance. How do you encourage the people you mentor to become leaders? I try to encourage mind-set shifts. First, be the harshest critic of your own recommendations. If you can’t articulate what could go wrong or what other alternatives you’ve considered, you are not done thinking. Second, understand that managing and developing your team is a big part of your job as a leader. Like any sports coach, knowing the strengths and opportunities of your team should influence how you think about recruiting, training, and talent management. Third, feel empowered and accountable for thinking bigger than your role, and act on it. Putting yourself in situations when you can’t lead from a place of authority is a great growth opportunity. When you must drive action through clarity of thinking, energy, and influence instead, you develop necessary leadership muscles that you can’t stretch in the same way when you focus solely on your scope. It also gives you broader context, exposes you to different ways of thinking and helps to develop your network. Finally, invest time in assessing and improving yourself. You’ll be the best leader you can be if you understand what you’re good at, what you want to improve, and what makes you happy. Who is a mentor who inspired you? I feel blessed, grateful, and lucky to have had many great mentors throughout my career. Maria Eugenia de Orozco (my first manager at Citibank) and Noelle Eder (chief information and digital officer at Hilton) are two of my most admired and beloved mentors. They always think bigger than their role, prioritize long-term and organization-wide solutions over what may serve them best immediately, and set ambitious and transformational goals that move people and organizations. They truly lead by example, with high standards, and deeply care. What I love the most is that while I have certainty they have my back and want the best for me, they always challenge me—they call me out, push my thinking, and inspire me to be my best. In this respect, they remind me of my parents! What is one of the biggest misconceptions that people have about leadership? A leader should always feel accountable for their teams and their outcomes, no matter what. I want my teams to grow and stretch, and I feel accountable for helping them do so. This includes empowering them to make decisions and have ownership. That said, it is my belief that even when you delegate decision-making, ultimately the accountability rests with you as the leader. The biggest misconception is that you can delegate accountability. Tell me about your work with HOLA, the Hispanic Business Resource Group (BRG). I am the accountable executive of HOLA, and in that role, I lead an enterprise-wide team effort to recruit and develop great talent as well as to engage with and support Hispanic associates already within the company. We partner with recruiting teams and external Hispanic networks so we can enrich our pipeline of candidates looking to join Capital One. We also focus on developing talent. For example, about few years ago we launched a high-potential leadership program for members of our network—which received great feedback. Our focus on engagement is about providing opportunities for people to get to know and support others in the network. This comes in the form of chats, events, and company-wide activities to celebrate festivities such as the Hispanic Heritage Month and Cinco de Mayo. All of Capital One’s Business Resource Group events are open for members and allies, so we get the opportunity to share our culture and ourselves not only with folks that are self-identified Hispanic but people who feel associated in other ways or are simply interested in getting to know people in the Business Resource Group. I struggled for years figuring out how to network. I understood it was important, but it is just something that doesn’t come naturally to me and the traditional tactics make me feel inauthentic. I eventually realized that I could make deep connections and broaden my network in a way that is genuine to who I am—I enjoy getting involved in things that are not specific to my direct accountabilities, so I volunteer to join cross-functional committees and extracurriculars, which allows me to establish and maintain connections with people that are in very different roles than I’m in. As you are developing in your career, questions and insecurities can be overwhelming. There are so many things to figure out, paths to choose from, things you can do better, and it somehow seems like everybody else has it figured out. When I embraced that my personal and professional development were constant journeys and that attempting perfection was a fool’s errand, life got better. I liberated myself from a lot of self-imposed pressure. Feedback became a gift, challenges became opportunities, failure became growing pains, and the success of others became sources of inspiration. Instead of living in a constant state of incompleteness, every accomplishment became a milestone worth celebrating. Internalizing that everyone is on their own journey and has their own insecurities allowed me to become more empathetic. Another thing that I wish I realized sooner is that authenticity is key as you grow into the type of leader you want to be. I can be inspired by others and even try to emulate behaviors and practices but, ultimately, I must be myself.